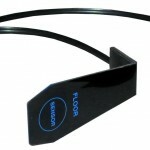 View Cart “Heel/Toe Strike Sensor Replace” has been added to your cart. Use this transducer to record heel and toe strike activity as the subject walks. The TSD111A uses two force sensitive resistors (FSR); typically, one FSR is attached to the sole of a shoe at the heel and the other FSR is attached at the toes. The FSRs indicate the precise pressure placed on the heel and on the toe as the subject walks. The TSD111A comes equipped with a 7.6-meter cable and is designed for direct connection to the HLT100C module. Heel/toe strike data is recorded on two analog input channels (one for heel strike, one for toe strike). Registered impulses on each channel simply reflect the timing marks associated with heel/toe strike contact during gait. The amplitude of each impulse is indicative of force measured at the time of strike. Although this amplitude value does not have an exact linear relationship to force, it is monotonically related. As force increases, amplitude increases. If precise force measurements are required, weights could be sequentially applied to each sensor to perform a rough calibration within a narrow operational range or an AcqKnowledge Expression channel could be used to linearize a heel/toe strike sensor over a wide operational range. Use two TSD111A transducers (four channels) to record from both feet simultaneously. Order additional sensors as RX111. See SS28A for the Telemetry System equivalent.